Cranky’s dream comes true, a bad dream that is. A brief peek into Cranky’s brain. 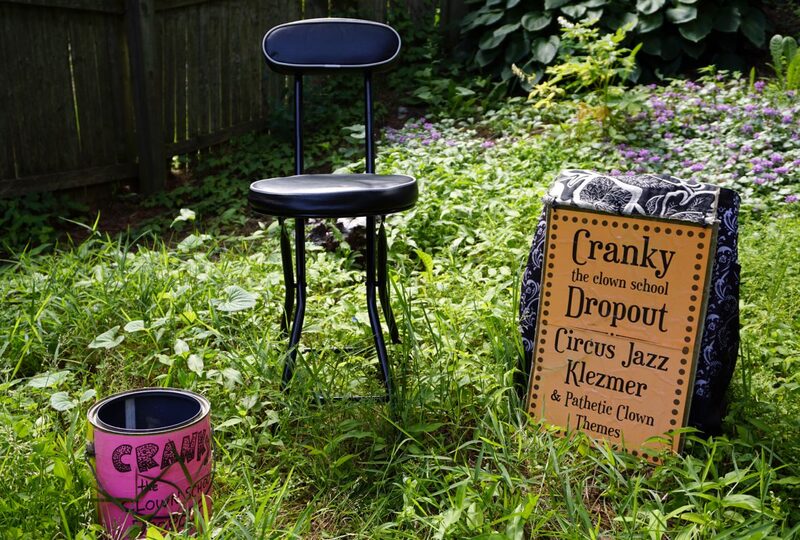 Here’s a behind the scenes story of Cranky’s that you are probably better off not knowing. So for all of you who have a rosy image of Cranky out there wearing his multi-colors, in a sax playing utopia, you can stop reading right now. No need to dirty up your picture with a lament on the mechanics of saxophone playing, involving saliva coated slabs of wood. The prelude to this story has to do with what saxophonists worry about. Every saxophonist anxiety dream starts like this: You are at a gig and if the dream is true to form it’s probably a performance where a lot is on the line in some way or another. You are setting up to play and you go to your reeds. Like any true saxophonist you bring several and unless you’ve become lazy these are reeds that you’ve tested and made sure are up to your standards. In the anxiety dream however, your reeds, all of them, are totally fucked. Here the dreams take on various permutations. Sometimes the reeds look ok and you put them on and blow and they don’t work or are really difficult to play. Sometimes you look to your reeds and they are all broken and have ragged edges. Cranky had a dream once where the reeds were playable – barely – but they were thick as cardboard (for the wind instrument illiterate, the end of the reed you stick in your mouth is tapered to a paper thin tip.). So that’s the typical saxophonist’s nightmare. Last Friday night Cranky lived through the reed-pocalypse for real. Cranky in his lazyass ways had been neglecting to work up some new reeds, relying on a handful of troopers that have played true for the past year. Typically saxophonists do their due diligence with reed maintenance, which involves buying a box of 10-12 of ‘em the right size/strength, then going through them and doing a quick check to see which ones are gonna fly and which ones are dogs. The next steps depends on the saxophonist’s preferences and obsessive compulsiveness in trying to make an imperfect thing perfect, but if it works great straight outta the box often there is no need to work on it. Woodwind reeds come from cane, which is a kind of giant grass (Arundo donnas, for those of you keeping score) like bamboo. So, technically it’s not ‘wood’ as in trees, but if you consider bamboo to be wood, then cane is too. Whatever. The point is, it’s a sliver of nature and does what human-manipulated nature will do, sometimes it reveals magical qualities and sometimes it rebels against control. So, Cranky shows up to play last night with four of these rebellious little slabs of wood soaked in water. Cranky always soaks 4-5 reeds about 15 minutes in advance of playing and then just before playing he quickly tries them out, picking the best of the lot and putting the rest in a reed case for backup. Friday night’s prep was no exception except subsequently two things happened. For his first mistake Cranky picked his fave reed of the batch without bothering to pre-test the others and secondly the fave reed got unnoticeably dinged in transit. So Cranky shows up, starts playing and noticed right away that the chosen reed, while playing just this side of ok was also making for a lot of work to sound decent. Then, just as in the bad dream, who shows up to listen to Cranky but another sax player. Cranky struggled through and probably gave a lousy impression to the dude. Cranky even made a show of taking off the mouthpiece and adjusting the reed, telegraphing to the other saxophonist, “it not me, it’s the goddamned reed.” The guy left after a song or two, and Cranky had had enough with that reed and decided to go with one of the three backups – the three bears, though none of them was ‘just right.’ They were all just wrong. One had a chunk out of the tip, which isn’t always a deal breaker, but this was too far gone. One would simply not play at all and was likely warped too badly, the third was playable but was obstinately stiff. Cranky played this last one for a few songs but it was like having to run uphill with leg weights on. After a few more songs he went back to the first reed, which had been soaking in a water bottle. The logic there being that perhaps it was a little dried when Cranky started out. But, upon closer examination it appeared that this reed had a hairline crack close to the tip which was the likely source of its aberrant behavior. So out of necessity Cranky, in a rare move, was force to pack up and leave due to technical difficulties. Well, that ain’t gonna happen again. Now here’s the redeeming part of the story. Cranky was so peeved at himself for having to pull the plug that immediately upon returning home he dug out a box full of ‘rejected’ reeds. These reeds were the ones mentioned above that had been turned down on their first encounter. It turns out that sometimes reeds get better with age. Just like wood, new reeds can be a little ‘green’ or not fully cured and they simply need to set for a while to achieve their full potential. These reeds have lain languishing for years and it seems that many of them turned out useful. To revive these little buggers Cranky set down with a couple cups of water, a rag, and two pieces of fine wet sandpaper of 320 and 400 grit. 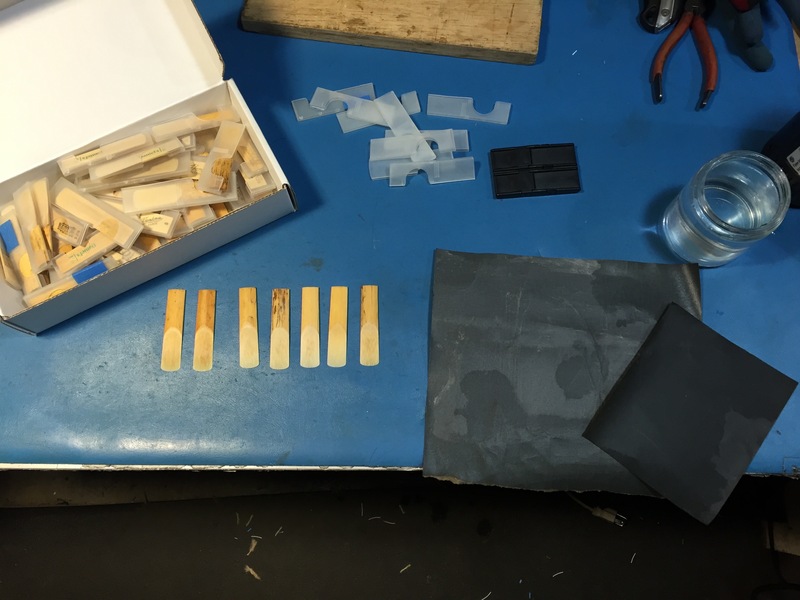 Going through the box of about 2 dozen alto reeds, Cranky was able to find seven good ones which he worked over with the sandpaper into excellent reeds. The true test came when Cranky went back out on the street last night to play, and much to his delight the reed played exceptionally well, far better than the old standby he’d been playing of all season long. And a happier, better playing Cranky made for a happier crowd of folks that night. So, in the end this turns out to be another grasshopper and the ant story, where taking the time to do the laborious task wins out over the happy-go-lucky slacker. That’s the other side of Cranky. Far more boring than his street antics, but come to think of it those aren’t all that exciting anyhow. Next postCranky head to toe.